Propagating Calopogon from seed is relatively easy to do. Calopogon seed germinates and grows readily on most agar media. However, mericloning has not as yet been successful in producing numerous plants. Thus a method of producing selected clones vegetatively was developed and is presented here. One needs to be aware of how the plant grows to understand how one might encourage multiple growths. 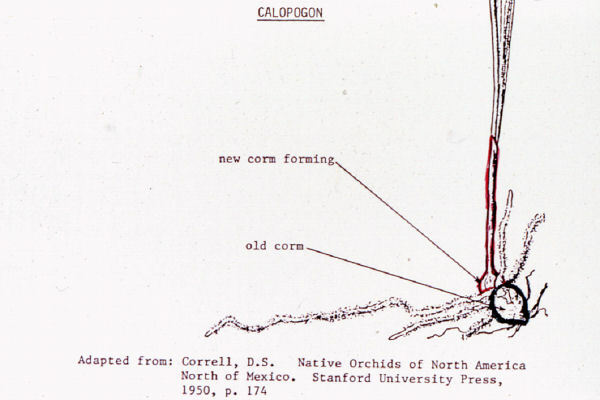 Calopogons grow from corms. They produce a plant from the primary eye on the corm which produces the flowering stem, when mature, and the new corm at its base (see Figure 1). The old corm dies off in the fall and disappears. If the plant flowers, the number of seed pods formed has a direct effect on the size of the new corm. The more pods, the smaller the new corm. In the wild, quite often the resulting corm in the fall will be too small to produce a flower stem the next year. If the first growth is damaged or destroyed, the secondary eye will develop and produce the corm for the following year. If for some reason, no flowers are pollinated or the flower stem is destroyed very early in the season, a secondary growth may be produced by the old corm, resulting in a secondary corm forming (see Figure 3). The development of the secondary eye into a plant and resulting corm is the key to the clonal propagation method presented here. Viewing the dormant corm, there are usually two eyes from which growth may appear the following year (see Figure 2). But, under normal conditions only one will develop. The object is to get both of them to develop at the same time early in the season to get two nice corms for the following year. To induce both eyes to form growths, the corm was cut into two equal pieces with one eye on each piece. These could be planted separately, but would require the cut to be protected in some way to reduce the chance of disease attacking the exposed tissue of the corm. Instead, super glue was applied to the cut pieces and they were glued back together again as if they were never cut apart in the first place. This not only protected the cut surfaces, but reduced the number of corms which needed to be planted. Planting was done with the same spacing as normally done. Initially, it was hoped that two medium size corms would result, but surprisingly not only did two corms result from this method, they were both as large as the original corm (see Figure 3). This of course is not the most rapid method for propagating selected clones but is to date the easiest and workable. Doubling the population annually can within a few years provide a nice population of the selected clones. Until we have perfected a method for mericloning them, this method is the surest and most rapid means of propagating selected clones of calopogons and their relatives including Eleorchis, Arethusa and their hybrids. It is interesting to find so many individuals afraid to try this on their own plants.